Attorney Michael Avenatti, shown here arriving in federal court this month, is accused of stealing millions of dollars from clients, among other charges. 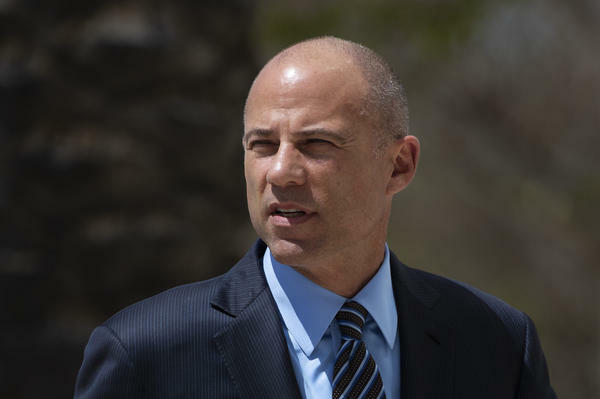 Celebrity lawyer Michael Avenatti, who is already accused of federal financial crimes, has been indicted on 36 counts of embezzlement and fraud by a California federal grand jury, U.S. prosecutors announced Thursday. If Avenatti is found guilty of all charges in the new indictment, he could be sentenced to a maximum of 335 years in prison. The lawyer had a rapid rise to fame, most prominently representing Stormy Daniels in the adult film actress's case against President Trump. He was a regular guest on cable news programs and even floated a Democratic presidential campaign, during which he told crowds: "I say, 'When they go low, we hit harder.' "
Now prosecutors allege that Avenatti stole millions of dollars from his clients. Those clients include "Client 1," a man who is paraplegic and who won a $4 million settlement from Los Angeles County. Prosecutors allege Avenatti drained money from the man's trust account and used the money to finance a coffee business and pay other expenses. "More than four years later, Client 1 is still waiting to receive his portion of the settlement," U.S. Attorney Nick Hanna said at a news conference in Los Angeles. According to court documents, prosecutors say Avenatti would occasionally send Client 1 "advance" payments that didn't exceed $1,900. He also allegedly undermined his paraplegic client's attempt to buy a house and jeopardized his Social Security payments by failing to file paperwork. In an emailed statement, law firm Greenberg Gross LLP identified Client 1 as a man named Geoffrey Johnson. "Mr. Johnson is the victim of an appalling fraud perpetrated by the one person who owed him loyalty and honesty most of all: his own lawyer," said attorney Josh Robbins. "Mr. Avenatti stole millions of dollars that were meant to compensate Mr. Johnson for a devastating injury, spent it on his own lavish lifestyle, then lied about it to Mr. Johnson for years to cover his tracks. His actions have left Mr. Johnson destitute." Avenatti denied the allegations in posts on Twitter. "I am entitled to a FULL presumption of innocence and am confident that justice will be done once ALL of the facts are known," he wrote. "I intend to fully fight all charges and plead NOT GUILTY. I look forward to the entire truth being known as opposed to a one-sided version meant to sideline me." In addition to Client 1, Hanna said, Avenatti followed a similar pattern with four other clients. "Mr. Avenatti received the money on behalf of clients and simply took the money to finance his businesses and personal expenses," Hanna said. In one of those instances, he said, Avenatti took some $2.5 million of a client's settlement money and put it toward a private jet. "As an attorney, holding your clients' money in trust is one of your highest duties. It is Lawyer 101: You do not steal your clients' money," said Hanna. Avenatti is accused of failing to pay income taxes — in fact, the federal probe that led to Thursday's indictment began as an IRS investigation in September 2016 as officials were trying to collect debts from Avenatti's coffee business, Tully's Coffee. "The indictment paints the picture of an individual who began to run afoul with the IRS nearly a decade ago," Ryan Korner, acting special agent in charge with the IRS' Criminal Investigation division, told reporters. Prosecutors also accuse Avenatti of filing fraudulent applications to a bank in Mississippi to obtain $4.1 million in loans and making false statements when his firm was facing bankruptcy proceedings. The alleged crimes "are all linked to one another because money generated from one set of crimes appears in the other sets — typically in the form of payments to lull victims and to prevent Mr. Avenatti's financial house of cards from collapsing," said Hanna. Avenatti is scheduled to be arraigned on April 29 in federal court in Orange County, Calif., the prosecutor's office said. In March, Avenatti was arrested in New York on separate federal charges and then freed on $300,000 bond. As NPR's Carrie Johnson reported, authorities "say he tried to extract more than $20 million from shoe giant Nike by threatening to use his ability to attract public attention if the company failed to meet his financial demands." After the charges were announced last month, Daniels, whose given name is Stephanie Clifford, said in a statement that she was "saddened but not shocked." "I made the decision more than a month ago to terminate Michael's services after discovering that he had dealt with me extremely dishonestly and there will be more announcements to come," she said.